Naval Air Station Oceana, Virginia Beach, Virginia – Ens. Rosemary Conatser (later Mariner) at the controls of a fleet composite Squadron Two, VC-2, S-2 Tracker Antisubmarine Aircraf,. Jan. 9, 1975. 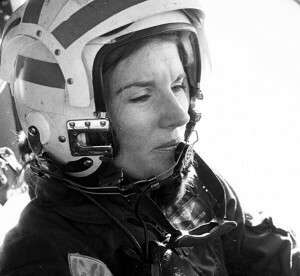 The U.S. Navy’s first female jet pilot passed away Jan. 24, 2019, at her home in Tennessee. She was 65. Capt. Rosemary Mariner, United States Navy, Retired, died on January 24, 2019, in the fifth year of her battle with ovarian cancer, with her husband and wingman of 40 years by her side. She was 65. Born in Harlingen, Texas, raised in San Diego, she graduated from Purdue University with a degree in aeronautics at 19. Mariner was one of the first eight women selected to fly military aircraft in 1973. After flight training in 1974, she became the Navy’s first female jet pilot flying the A-4C and the A-7E Corsair II. She moved to the Naval Weapons Center in China Lake, Calif., then Air Test and Evaluation Squadron 5. For sea duty, in 1982 she reported aboard USS Lexington, where she qualified as a Surface Warfare Officer. To honor Mariner, the U.S. Navy will perform the first ever all-female ‘Missing Man’ flyover at her funeral Feb. 2 in Maynardville, Tenn. The Missing Man flyover is a special tribute honoring the service of aviators who have served their country, and features four aircraft flying above the funeral service in formation as one of the aircraft leaves the formation and climbs vertically into the heavens. Ens. 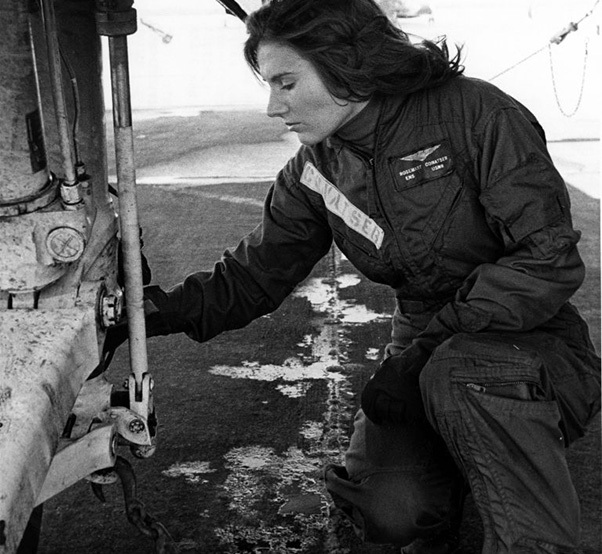 Rosemary Conaster (later Mariner) makes pre-flight checks of the main gear of a fleet composite squadron two, VC-2, S-2 tracker antisubmarine aircraft. In 1990, she became the first woman to command a military aviation squadron, VAQ-34, based at the Pacific Missile Test Center at Pt. Mugu, Calif. She attended the National War College in Washington, D.C., earning a Master’s in National Security Strategy, and served on the Staff of the Joint Chiefs in the Pentagon. Her final military assignment was as the Chairman of the Joint Chief’s Chair in Military Strategy at the National War College, before retiring in 1997. Mariner was instrumental in the repeal of restrictions on women serving in combat. In retirement, Mariner was a resident scholar at the Center for the Study of War and Society at the University of Tennessee in the History Department where she taught classes in military history, emphasizing the intersections of war and conscience. She continued to serve as an adviser on national defense policy and women’s integration into the military for ABC News, PBS and the Department of the Navy.